As the Marvel Cinematic Universe expands into Phase 3 with some bold new event films (Avengers: Infinity War) as well as some much-needed new solo characters (Black Panther, Captain Marvel) there are also a lot of MCU superheroes we already know and love to catch up with. Among those heroes is Thor Odinson, who (unlike his teammates) headed for far off places following the events of Avengers: Age of Ultron. Thor: Ragnarok will catch up to the Thunder God when he returns home to Asgard, only to find his homeland in a state of peril. [Thor 2 Ending SPOILER approaching…] With Loki (Tom Hiddleston) now seated on the throne in impersonation of his father Odin (Anthony Hopkins) – not to mention the doomsday implications of the title – it’s probably a good thing that Thor is bringing Mark Ruffalo’s Hulk along for the fight. 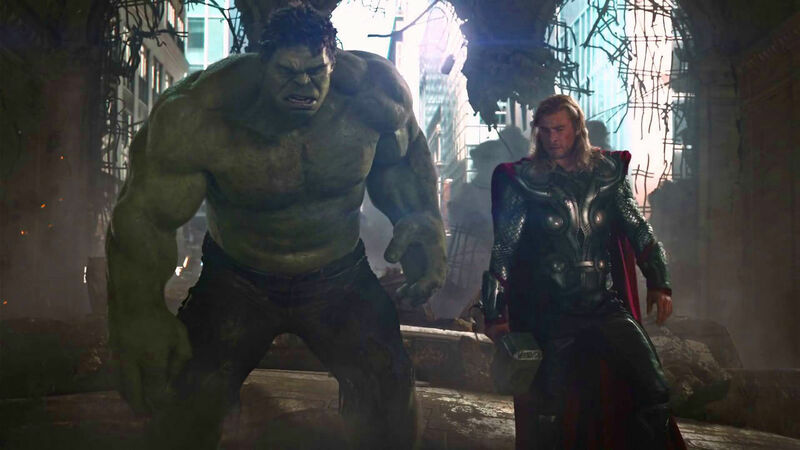 Hulk and Thor had a very memorable fight scene in The Avengers, as well as one of the biggest and best team action sequences (space whale kills #FTW) – which was forever immortalized by arguably one of the best superhero comedic moments to date (Hulk’s Thor-punch). That dynamic between the two titans is something Marvel has certainly taken notice of; the company’s Avengers Assemble cartoon series plays up the Hulk/Thor relationship big time, with entire episodes dedicated to the duo’s competitive camaraderie. Of course, in a cartoon series it’s easy to have Hulk’s primary buddy be a Thunder God; harder to paint that picture on the big screen, where creating Hulk and/or Thor’s powers come at much higher cost. Having Bruce Banner and Tony Stark be buddies (for example), is much more cost-effective, because it’s essentially two actors talking until their CGI counterparts take over for limited screen time. That’s all to say: it’ll be interesting to see how Thor 3 makes the buddy dynamic work between Banner and Thor, assuming Ruffalo himself will be onscreen a good deal of the time. There’s also the slight disappointment of seeing Chris Hemsworth’s Thor once again having to split duties in his own solo franchise – lest we forget the “buddy comedy” between Thor and Loki that arguably was Thor: The Dark World…. In a larger sense: this growing impression of Thor: Ragnarok as a Hulk/Thor team-up film is raising a valid question: are Marvel’s ‘standalone’ solo film sequels even qualified to be called that anymore? Captain America: Civil War is basically Avengers 2.5/Iron Man 3.5, and now Thor 3 is pulling double duty as a the Hulk solo film sequel we never saw; even Ant-Man is sharing the marquee for his “solo” film sequel, Ant-Man & The Wasp, so what’s really the gameplan at this point? And will new films like Doctor Strange or Black Panther or the Spider-Man reboot be more standalone – or will they too become delivery systems for multi-character event films?